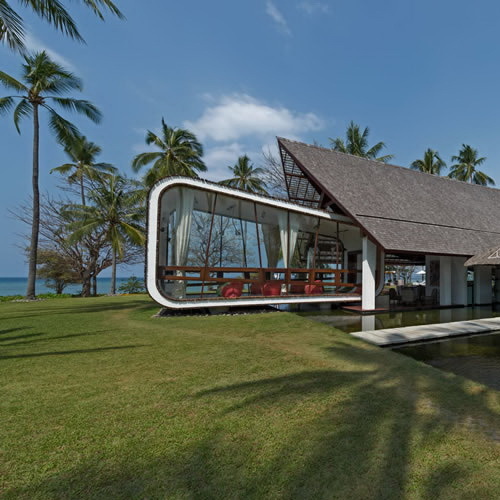 Tinuku ~ Villa Sapi Lombok on Sire Beach, Lombok Island, combines traditional and futuristic contemporary elements as best resting with the feel very unique in very quiet location in the middle of wild beautiful tropical island. 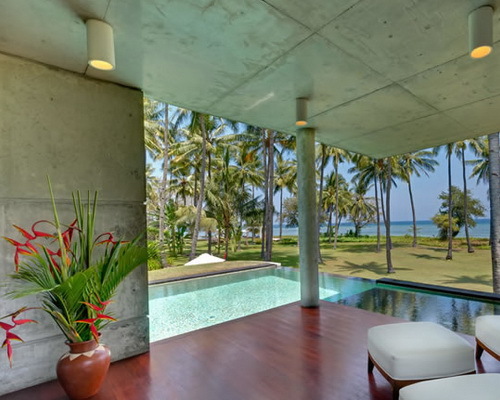 Villa Sapi right on Sire Beach area, Tanjung, Medana, North Lombok designed by David Lombardi to feature a blend of traditional ethnic literature and contemporary style implemented into the architectural complex of luxury buildings. 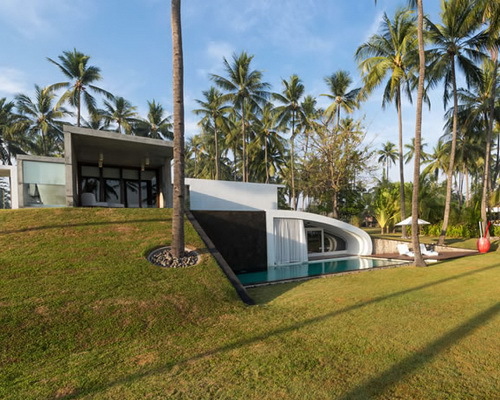 Holiday atmosphere already embedded in the dream house design on beautiful landscape. Different design from the standpoint because the heading of any new elements consists of two free-standing buildings and distinctive design surrounded by beautiful tropical gardens full of fish ponds. Resort stands on 3 hectares area directly overlooking the Java Sea is crystal clear and beautifully surrounded by collection of beautiful palm trees. 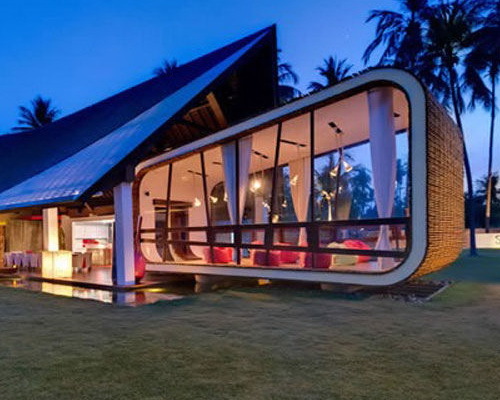 Cool and pleasant tropical villa to recharge using ethnic-style roof, but the interior and facade is contemporary style. 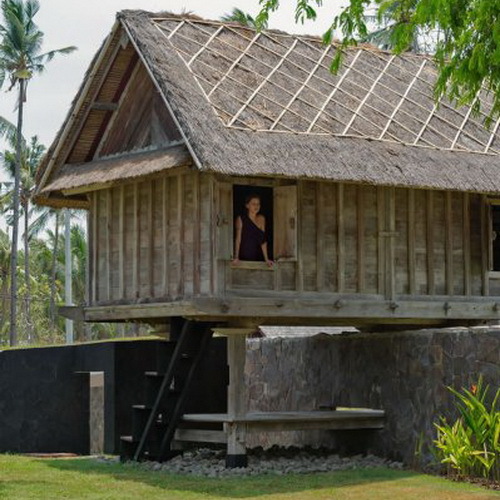 Traditional architecture roof style using wood, bamboo and woven fibers trees are very typical in the literature of ethnology Indonesia. Quadrangular and triangular corners firm closing of the main building is deliberately exposed as the main design. 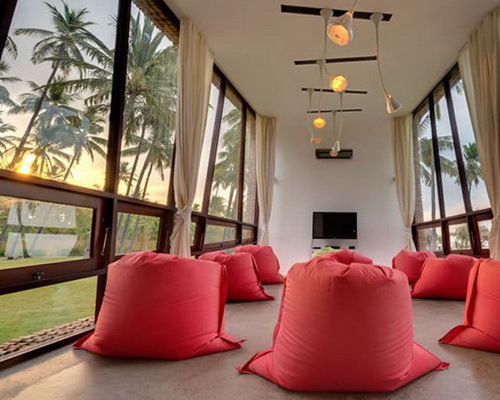 An entertainment room the furutistik architectural style resembling floating terrace on the ground. Contemporary pavilion elongated cuboid has curved corners predominantly transparent glass facade to present modern impression. Materials used to build the villa is plain cement, bamboo, wood, straw, natural stone and natural sand from the local region. The combination of modern and traditional elements also implemented for interior is perfect to add some furniture in black, red and lime green. Semi-open shower room wall expose the plain cement for passive décor. 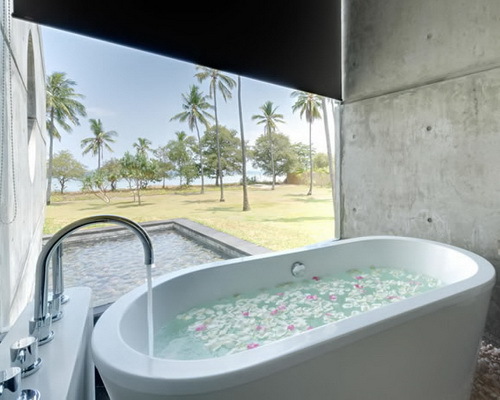 Bathtub made from plain white porcelain placed over white stones are very impressive shower like a king. Water pipes and taps made of minimalis stainless steel to bring modern and clean accents. Lombok distinctive artwork such as sculptures, colorful pottery, wall hangings in the form of woven to create traditional taste in modern architecture. 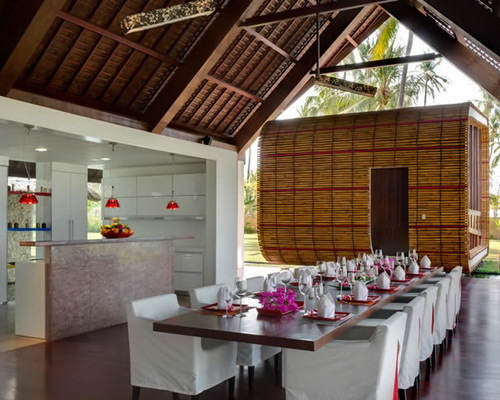 The dining room is semi-open roofed natural brown wood combined with glass, white walls and modern furniture. Outdoor design further living implement living ornaments in the form of beautiful lawns, palm trees, fish pond and tropical flowering plants. 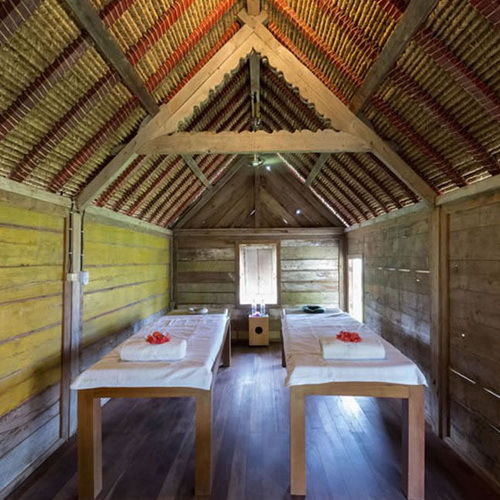 A traditional architectural style stilt houses built using material one hundred percent wood and bamboo to give touch of strong ethnographic. Swimming pool in open constructed using river rocks in black and has natural rough texture. The pool directly touching white sand patterned. 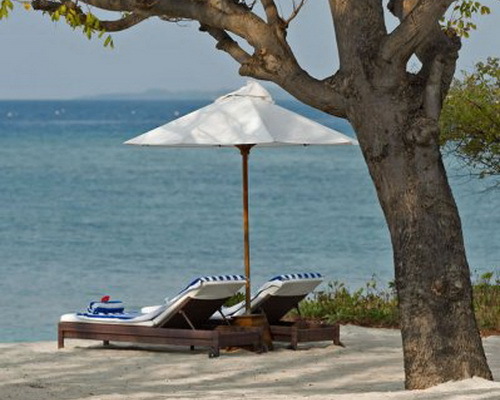 Wooden chairs for sunbathing and comfortable for lazing have the traditional Balinese umbrellas.